Based on reviews from 79 experts and 2,614 users. Learn how our rankings work or see our guide to James Harden basketball shoes. Updated Apr 2019. James Edward Harden Jr., or "The Beard" as he is fondly called by his fans, is a multi-time NBA All-Star and a two-time gold-medal-winning member of the USA national basketball team. He was also named by his peers as the Most Valuable Player at the National Basketball Players Association's first annual Players Awards. 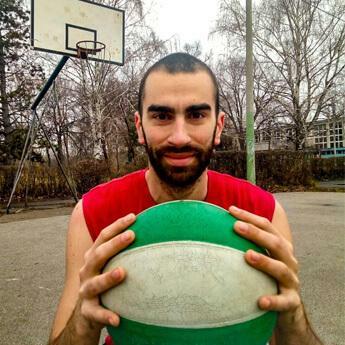 He is widely regarded as the best shooting guard in the league. He currently plays for the Houston Rockets, where he has transitioned into doing most of his work as a point guard that fits Mike D'Antoni's high-octane offense seamlessly. It is safe to say that Harden has mastered the art of offense. You might call this an exaggeration, but because of his ability to score and keep his teammates involved, it is tough to contest this. This is the truth, and with every scoring outburst and with every triple-double that he records on almost a nightly basis, his critics have begun to accept this as well. There's just no stopping this man. He can beat you in a variety of ways. Play him straight up, and he'll beat you to the basket. Give him some space, and he'll shoot over you. Double team him, and he'll always find the open man. This is what separates Harden from his peers. Many players can score the ball. But it's his ability to both score and facilitate the ball that makes him truly exceptional. When Harden first entered the league, he drew comparisons to Manu Ginobili, primarily because they're both left-handed, they're both crafty with the ball, and they both love the Euro-Step. The Oklahoma City Thunder chose The Beard as the third overall pick in the 2009 NBA draft, teaming him up with Kevin Durant, Russell Westbrook, and Serge Ibaka. They formed one of the NBA’s best rosters. Harden proved to be a huge part of that success when he won the NBA Sixth Man of the Year in 2012. The Thunder shocked the NBA world when they traded Harden to the Houston Rockets the following offseason. In retrospect, this was probably the best thing that could have happened to him. Moving to the Rockets unleashed Harden's full potential and made him the cornerstone of the franchise, something he didn't have in Oklahoma where he had to share the spotlight with Durant and Westbrook. In Houston, Mike D'Antoni has turned Harden into Steve Nash 2.0. He has given Harden full rein of the offense. The management has surrounded Harden with capable shooters, and this has allowed The Beard to exploit whoever is defending him. He has blossomed in D'Antoni's fast-paced offense and is now a consensus Top 5 player in the league. Many coaches have gone on record to say that Harden changes the way they gameplan for a team. It is just super tough to strategize for someone who is that crafty, skillful, and athletic. And to top it off, he makes it so easy for others around him. His teammates have testified numerous times that it’s a joy to be on the court with The Beard because he attracts so much attention from the opposing team, giving them, his teammates, opportunities for open shots all the time. The past offseason, Houston completed a blockbuster trade to pair Harden with another All-Star and future Hall of Fame guard Chris Paul. The duo has befuddled opposing teams on how to guard them, and they have wrecked pretty much all the competition, save for a handful of teams. With James leading the way, the Rockets have a bright future ahead of them. Unlike other NBA superstars that receive a signature shoe right off the bat, James Harden had to go through his first years signature shoe-less. However, it wasn't all bad as the athlete was signed with Nike as an endorser of several team shoe models. During Harden’s stint at Nike, which is undoubtedly dominated by LeBron James, he was able to endorse some of the brand’s high-performing team model basketball shoes. The Nike Zoom Crusader, Nike Zoom Run the One, Nike HyperRev 2015, and the Nike HyperChase are just some of Nike basketball shoes James Harden endorsed. In 2015, the NBA athlete was finally offered a signature shoe deal by the Three Stripes. He joins stars Derrick Rose and Damian Lillard in Adidas’s roster of greats. Below are some of the James Harden basketball shoes that are released after just three years with Adidas. James Harden’s first ever signature shoe, the Harden Vol. 1, was released on November 23, 2016. The release date was also gameday for the Houston Rockets against the Toronto Raptors. The Rockets lost, unfortunately. But what Harden gained that day made up for the game's loses. Primeknit is used for the low-top’s upper and full-length Boost for the midsole, bringing two of Adidas’ best technologies in just one pair of J Harden sneakers. Each colorway of the Vol. 1, however, may feature a different material in the upper. Some colorways use knitted mesh, which is stiffer than the premium Primeknit material. The material used for the shoe’s midsole is regarded as the most comfortable Adidas cushion. For the first pair of signature James Harden basketball shoes, the Boost is made thinner than usual so that it perfectly balances court feel and impact protection, pretty much like how Nike’s Zoom Air cushioning does in shoes such as the KD 10 and Air Zoom Generation. The Boost cushioning is completely encased on the lateral side for firmness while the medial side is partially exposed. James Harden is usually one of the basketball players that has the most minutes played in the NBA.Thus, it is a no-brainer to use Boost on the J Harden sneakers. The traction features a unique pattern as designers from Adidas' innovation lab used advanced software to record and create a pattern that fits Harden's feet pressure points and movements on-court. The result is a Fibonacci-looking shape that densifies at the forefoot for extra grip during pivotal movements. For lockdown, the shoe implements an asymmetrical dual-hole lacing system that ensures that the shoe grasps the player’s foot securely, ensuring no slippage. Harden is known to be at the 98th percentile of players in terms of quickness in stopping, which is the reason for the shoe’s unique toe box. An issue that quick-cutting players often experience is their toes slamming on the toe box. This is solved by making the toe box slightly independent from the shoe’s upper. Thus, the Harden Vol. 1 sports an eccentric shroud on the forefoot, protecting the athlete’s toes and keeps the foot contained. The independent forefoot cover is made of leather and may need time to break in. The first colorway is the "Imma Be A Star, Harden Volume 1", which tells the story of the ninth-grader Harden writing his mother a note saying, "Could u wake me up at 7:00 and could u leave me a couple of dollars... P.S. Keep this paper Imma be a [star]." To this day, Monja Willis, Harden's mother and personal manager still keeps this piece of paper with her with the joy of knowing that his son's dream has been fulfilled. 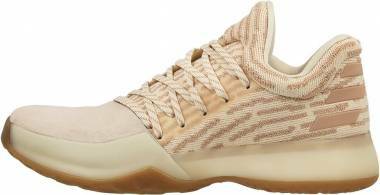 Harden chose this colorway to impart that story of accomplishment. A few weeks after the first release, another colorway of the James Harden shoes was also debuted, and it was called the “Pioneer” colorway. The black, red, and white colorway of the shoe represents Lakewood's Artesia High School team, Harden's high school basketball team, which he led into two state championships, jumpstarting his rise to stardom and putting him on the map as a solid basketball player. James Harden also chose to honor Arizona State University, his college alma mater, through the colorways “Fear the Fork” and the “Gila Monster.” The black and sun gold colorway of “Fear the Fork” uses the Sun Gold Devil’s team color. The pink and gray colorway takes its inspiration from the Gila monster, a venomous lizard that is native to the state. For the 2017 All-Star Weekend, the “No Brakes” colorway was released, featuring a gray Primeknit upper with purple and orange detailing on the outsole and laces. As the Houston Rockets prepare for the final stretch of the 2016-2017 Finals Championship, James Harden pushes on, full throttle, with no brakes. Personal touches are minimal compared to other players’ signature shoes. However, a few details that pertain to Harden’s family such as his mother and grandmother’s birthdate are molded into the heel of both the left and right shoe. While the 4-time NBA All-star’s signature is embossed on the medial side of the shoe’s forefoot. Released several months after the first Harden basketball sneakers, the B/E or also called BTE shoes were debuted overseas as an exclusive model. The name stands for "Brothers Through Everything," which is a personal motto of James Harden. The James Harden shoes retain the traction pattern of the Vol. 1. However, the midsole and upper materials are completely revamped. Instead of having Boost in the midsole, the shoe has Bounce. This material feels firmer and a bit cheaper than the original cushioning. A lot of testers like the second iteration, though, since it makes the foot feel light and responsive. A combination of mesh, foam, and leather are used on the one-piece bootie upper. The main mesh layer provides breathability to the foot and protection for the lightweight foam underneath. The foam, on the other hand, is die-cut with shapes that are similar to the pattern on the outsole. A leather tongue that connects to the subtle toe cap is the top most layer. It is an added detail that gives a nod to Harden's love for classic basketball shoes. The dual-lacing system remains the same, but for this model, the loop holes are reinforced for a more durable shoe. James Harden has three tiers in his Adidas signature line. The first encompasses the performance models that are widely available in the States and other countries. The second tier provides cheaper alternatives to the performance models. The third tier is where James Harden's lifestyle edition kicks are categorized. The Harden LS is a basketball-inspired lifestyle shoe that can still be worn on-court as a performance sneaker. 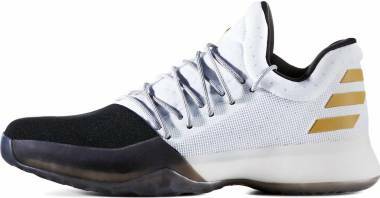 These J Harden sneakers have a simpler-looking silhouette than the original model. The shoe uses a softer Primeknit for its upper and initially debuted in four colorways: the "Night Life," which is predominantly black with an iridescent Harden and Adidas logo; the "Fast Life," which comes in a red and orange upper; a white and light grey combi upper that is named "LA Life"; and lastly, the "Sweet Life" that is dressed in pink and gold. The shoe uses the same Fibonacci-inspired traction pattern and the same Boost midsole as the Harden Vol. 1 basketball shoes. However, the cushion is no longer caged, making the foam less firm and more comfortable for casual wear. 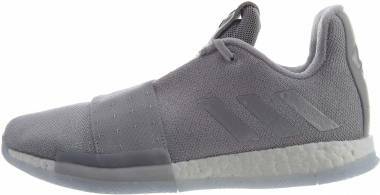 Another feature that is retained by the lifestyle Adidas Harden shoes is the burrito-wrap upper and the dual-lacing system that provides ample lockdown. The toe-cap is not included for a cleaner look. Lonzo Ball wore the Harden LS when he played against the Cleveland Cavaliers, winning a spot for the Lakers in the league's 2016-2017 quarterfinals with a score of 94-83. The first colorway represents Harden's love for California, the place where the young Harden was able to cultivate his love and skill for basketball. These James Harden shoes come in a peach, teal, and lavender upper which alludes to the state's summer sunsets. 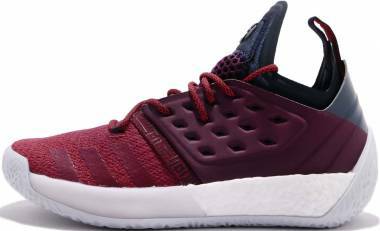 The different shades of burgundy on the "Ignite" colorway represents the athlete's ability to score on command regardless if it be through his classic step-back 3-pointer or through his effective assists. Harden being dubbed as the best offensive player in the NBA, goes undoubted as he fires up the Houston Rockets for another championship. For the third colorway "Vision", the shades of green stand for Audubon Middle School, the place where the vision to become the great NBA star that he is now came to be. As for the specifications of the second Harden basketball shoes, they take after the first model’s one-piece bootie upper. 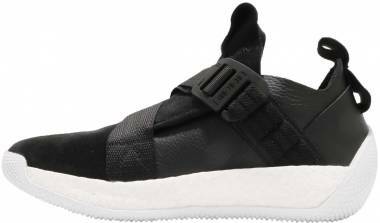 Technology-wise, Adidas implements a fuse-lined neoprene for the heel to midfoot, mesh on the tongue, and ForgeFiber on the forefoot upper. ForgeFiber is the newest Adidas innovation that utilizes textile, special stitching technique, and a TPU-coated thread to maximally enhance the fabric's stretch, strength, and support. Heat and compression are also applied to the fabric in order to forge the fibers together and form a cohesive material. The density of the stitches is customizable to fit each athlete's needs. James Harden puts prime on a shoe that doesn't budge when worn because his game is all about quick directional changes. Because of this, it only makes sense that the Harden Vol. 2 has molded polyurethane side panels that form part of the customizable lacing system. This system follows the same principle applied on the Adidas D Lillard 3. Once again, a full-length Boost is featured on the Adidas Harden shoes midsole. Compared to the previous model, however, the cushioning on the Vol. 2 is a much thicker and chunkier Boost–keeping Harden comfortable and fresh upto the fourth quarter since the athlete plays one of the most minutes per game. The traction pattern on the outsole is similar to the pattern of the Vol. 1, and it still based on the data gathered from the NBA All-Star's foot pressure map. The shapes just differ in sizes. According to Vol. 2 lead designer Rashad Williams, "The pods on the bottom are all the same fit but not the same size, as you get to the smaller clusters, that is where James puts the most pressure on his foot." However, unlike the first model, the jagged shapes extends to the back of the heel. From Sixth Man of the Year to league MVP, James Harden finally received the credit he deserved after an impressive 2017-2018 season. His unconventional style has propelled him to the top and makes him one of the most potent offensive players the NBA has ever seen. These low-top basketball shoes boast a full-length Boost midsole for incredible energy return. A lace band across the midfoot provides enhanced lockdown while a traditional herringbone traction pattern gives James the ability to decelerate with ease. These Adidas basketball shoes arrive in two colorways. The ‘Voyage’ colorway commemorates James’s voyage in bringing home a championship to Houston while the ‘Cosmo’ colorway represents his ability to leave his defenders lost in space. Global Product Manager of Adida Corey Allen shares in an interview, “James Harden, from day one, has been super involved. He’s helped us design and worked on colorways.” designers who have helped the player craft his signature line echoes this statement. They describe him as someone who is very committed to his product; they even consider him as a co-creator of the shoes. Below are some of the footwear designers who had a hand in the creation of the various James Harden basketball shoes. Brian Foresta. An alumnus from Pratt Institute with a degree in Industrial Design, Brian Foresta is currently the Vice President of Design at Adidas. Starting out as a freelance footwear designer for Ralph Lauren, he slowly climbed up the ladder working for companies such as the leading American sports brand Nike and Nike subsidiary Reebok. Upon his transfer to Adidas, Foresta helped create the James Harden's Vol. 1. Rashad Williams. Standing as the lead designer for the Harden Vol. 2, Rashad Williams graduated from Brandeis University with a Bachelor’s Degree in American Studies. He is currently the Senior Director for Basketball Footwear at Adidas. He used to work for Kevin Plank's Under Armour and Nike. Dillon Patrick. A graduate of Carnegie Mellon University with a degree of Industrial and Product Design, Dillon Patrick was one of the youngest footwear designers to create multiple team model shoes for Adidas. Patrick designed the D Rose Dominate, Light Em Up 2, and the Harden B/E. Release dates of signature shoes are usually a huge event for sneakerheads. Depending on the athlete and the shoe’s appeal, the release date is an anticipated day where fans line up either offline or online to cop a pair of the freshly debuted shoe. For James Harden, his lifestyle-inspired shoes such as the Harden LS and the Harden B/E, have consistently dropped during the summer season. While his two main signature shoes, the Harden Vol. 1 and Vol. 2, was released right before the Thanksgiving weekend and during the NBA All-Star weekend respectively. Black Friday. Right after the Thanksgiving weekend, Christmas shopping usually happens during this time because of the huge drop in prices. Start of the year. It is common for people to make New Year’s resolutions to live a healthier lifestyle. Sportswear companies usually offer sales during this time in order to answer for the need. After Winter. During the cold months, not much outdoor activities can be done due to the freezing temperatures. Thus, when the time comes that the weather becomes tolerable, many flock to resume their outdoor activities such as hiking, running, and some street workouts. Right before the release of the newest model. Local shoe stores try to sell of the old models of a signature line, right before the release in order to monopolize sales for the newest shoe edition. What is James Harden’s contract value and duration with Adidas? After seven years of being in the league and the expiration of his Nike endorsement contract, Harden signs a $200 million shoe contract with Adidas in 2015. The contract covers a span of 13 years. It was stipulated in the agreement that the full amount will only be paid if the player will be able to attain certain goals such as winning the Finals MVP during the duration of the 13-year contract. What is the story behind James Harden’s iconic beard?